For the first time in more than a year, we have both beef and lamb available for sale on our website. We've changed our beef club format to once a year, which allows us to serve more customers. You can order (or reorder) any time, while supplies last. Our 25-pound beef box is $225 and our 20 pound lamb share is $250, before club discounts; your beef or wine club discounts automatically apply to all purchases. We also have plenty of ground beef available, which continues to be a best-seller. We offer the ground beef in 10 and 20 pound boxes, to be picked up at J&R in Paso, at the ranch by appointment, or shipped anywhere in CA. Our 2012 Mistletoe won Gold at the Central Coast Wine Competition—Best of Cabernet Blends! It was featured at the Mid-State Fair by the glass and is newly released and available on our website. 2012 was a hot year, resulting in a fruity, powerful wine with more vivid tannins than any other vintage thus far. It’s drinking beautifully and is a real crowd-pleaser. We have also released the 2012 GSM and Zinfandel, which share the exuberant personality of the vintage. Think Big. Think Fun. But these wines are still balanced by that trademark Rangeland acidity and freshness. You can order any of our wines from www.rangelandwines.com/Wines. Second Press Restaurant, on the park in downtown Paso, is hosting a Rangeland winemaker dinner at 6pm on August 7. The 4 course meal will feature fresh, estate raised grass-fed lamb, paired with Rangeland wines. Winemaker Shannon Gustafson and Chef Ryan Swarthout will host the dinner, and Laird and Lisa Foshay will be there to explain our growning practices and enjoy your company. Cost is $60/person, $50 for wine club members. Contact Second Press for reservations at 805-226-7500. Veraison is occurring throughout the vineyard as we write. Veraison, a French term meaning “onset of ripening”, marks the transition from berry growth to berry ripening, from green, hard grapes to soft purple clusters. 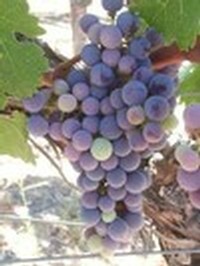 Drought conditions mean smaller berries, which raises the ratio of skins--which carry much of the wine flavor, color and texture--to juice. So expect another dark, powerful vintage from 2014. Because we’ve had a hot, dry year, we expect to be harvesting full steam in September. 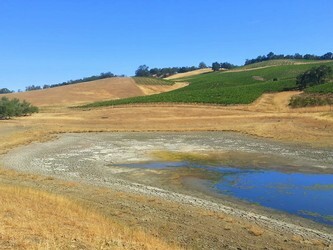 Naturally the drought has had an effect on our ranch and our businesses. Our lake, pictured here, is the lowest it’s ever been. This was the first year since we’ve bought the ranch in 2000 that the lake didn’t spill over during winter and, by local legend, the first year it did not fill since it was built in the 1940s. We’ve using it for irrigation all season, and even though we’re pumping well water back into the lake continuously, it hasn’t been able to keep up with use and evaporation. All year we’ve been developing new spring water sources and hope to get through to grape harvest and winter without further livestock herd reductions or expensive hay purchases. We are hoping for a rainy winter, and looking forward to complaining about the wet for a change. Bring it, Mother Nature! This year’s drought forced us to sell about 30 cows in January, since we didn't have enough feed for our entire herd. The drought coincided with a beef club waiting list of more than 100 people, which caused us to rethink our Beef Club. Rather than delivering club boxes twice a year (July and November), we are now offering the beef club only once a year, right after the beef harvest in July.